We have published a few articles that talk about the ways you can best deter a burglar. It is, after all, a very important subject and the public should be informed. This time, however, we are going in a different direction and telling you about deterrents that are bad ideas because they just don’t work. 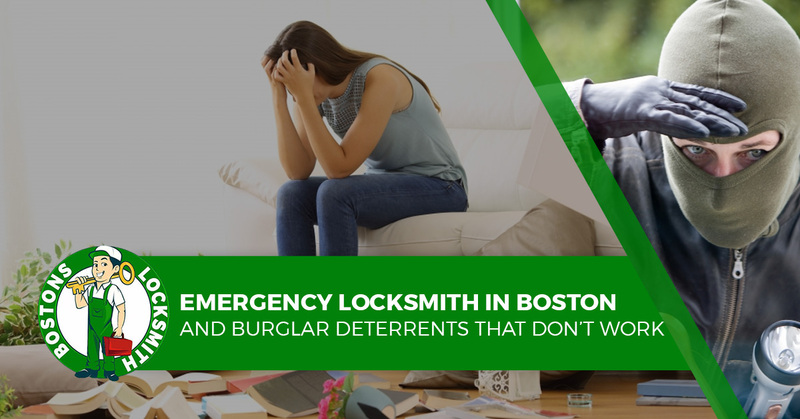 Bostons Locksmith, your emergency locksmith in Boston, offers the burglar deterrents that aren’t fooling anyone. The person who breaks in your home will head straight to the master bedroom. This is because it is common knowledge that this is where people hide their most valuable assets. Think about it, if you have expensive jewelry, cash and other valuable items, you aren’t likely to stash them in the dining room or laundry room. Ironically, those rooms are the last place a burglar would think to look for your Rolex watch and stash of cash. Other areas that burglars might not consider to look is in kitchen cabinets, kid’s bedrooms and in air vents. A burglar will stake out your house for days if not longer before making his move. So if you are the type of person who leaves lights on when you are away from your home, it’s probably not doing any good. In addition, seeing lights on in a house in the middle of the day looks a little suspicious. Plus, you are paying extra to keep all your lights on all of the time. What you might try is to buy a few smart lights that will turn on and off at intermittent intervals. This would throw off anybody who might be trying to break into your home. If someone is watching your home, going for days without mail delivery makes it pretty obvious that nobody is home. It would be a better idea to have mail delivery continue and have a friend or neighbor pick it up on a daily basis. Real security signs from real businesses do help prevent people from breaking into your home. These signs are a signal to the burglar that if they try to break in, an alarm will go off or something else will happen that will stop them in their tracks. The only thing a fake sign will do is lull you into a false sense of security. Any burglar with any common sense can Google the name on the sign to reveal if it is real or fake. And they can do this right from their smartphone, it takes about two minutes to call your bluff. Big dogs might look scary, but not all burglars will refrain from breaking into your home. Big dogs can be rather quiet and easily influenced by somebody with treats or a happy demeanor. By comparison, many small dogs are rather noisy and bark at everything. And because many small dogs are so insecure, they don’t trust anybody, even if they have a steak to feed them. If you need to update the locks on your home to be more secure, give Bostons Locksmith a call.